One recurring moment in my childhood with my dad stands out above many others. I can remember many times when he’d decline the offer and I’d skip ahead for a few moments before deciding walking was fine. But sometimes, sometimes, dad would accept and I’d be delighted. “READYSETGO!! !” I’d yell and take off before I thought he’d ever have a chance to catch me. But he always caught up with me. Always. Even in my teenage years, my dad in his early 50’s, he’d still catch me. And if that wasn’t bad enough, he’d catch up to me, keep pace, then quickly switch directions and start running backwards. I cannot put into words how much this frustrated me. I’d then try to speed up before ultimately admitting defeat. Again. I mean, how could I *ahem* let my dad win, how was it that he could always outrun me? From these many moments of acquiring bruised pride, it’s dad’s smirk I remember the most from these moments. It was always with a smirk that he would speed past me, antagonizing me about not catching him. It was his smirk that would bother me, almost to the point of anger, as he ran backwards, asking me why I wasn’t winning as we raced. Throughout my childhood, my dad repeatedly claimed victory over me when we’d race each other while running. And every single race, halfway through he’d opt to switch things up and run backwards. It was my dad’s smirk I was thinking of while playing tag with a bunch of kids at the playground on the fateful day of May 22nd. I was envisioning his face as he’d pass me by, knowing how much it frustrated me to lose to someone running backwards. It was his cocky, self-assuredness I felt I was embracing in replicating his trademark move while I chased a second grader across part of a field. But the next move I made wasn’t one I ever witnessed him do. As I took one step after another in quick succession, running backwards and almost outpacing the child I was antagonizing, I caught my foot on a clump of grass. As I rolled my ankle, the vision of my dad’s smirk was still at the forefront of my mind…until the pain became so intense I felt as though I would be sick to my stomach. In that instant, I knew it was bad. The sound from my ankle wasn’t pretty, the pain was severe; I didn’t think I’d ever be able to take another step. Embracing the stubbornness I inherited from both of my parents, I didn’t allow myself to visit the doctor that day. Or the next. But on the third day, after not sleeping from pain for two nights, I decided I needed to get things checked out. “How did you get injured?” the doctor asked me. His only response was to quickly cover his face with my medical file, trying to hide the fact that he was stifling his laughter. I smiled and assured him that I found humor in it also. I mean, it’s probably not every day that a 31 year old visits urgent care for tag-induced injuries. 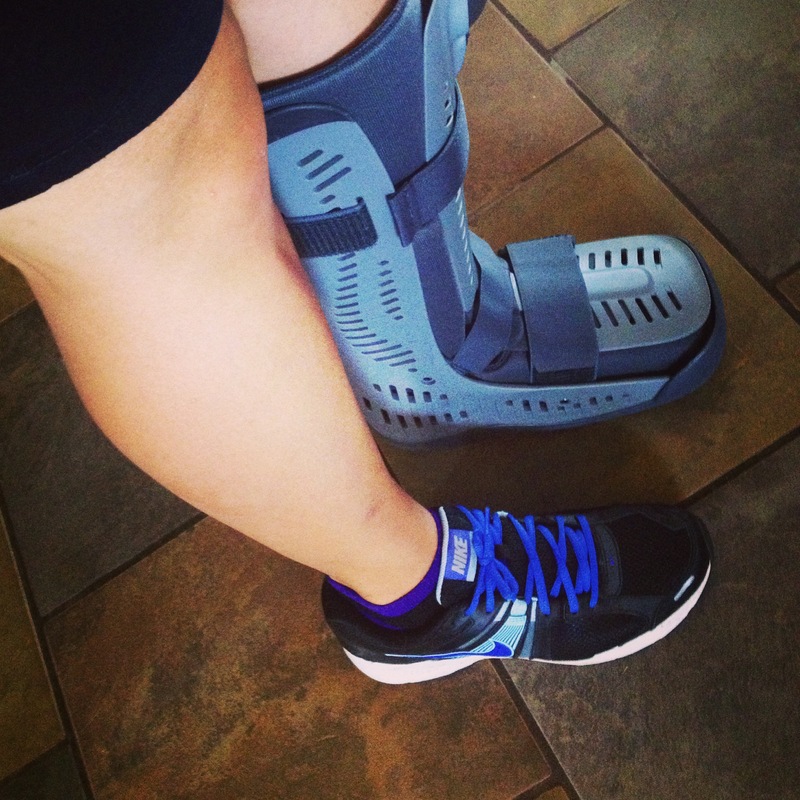 A high ankle sprain, torn ligaments and badly bruised pride were the diagnoses I received. Two weeks he told me and I’d be feeling better. Not a fan of the urgent care doctor, in hindsight. After six weeks of not healing as quickly as I’d hoped, still experiencing pain and lack of mobility, I went to the doctor. My primary care physician decided my injury was too severe for her to treat appropriately and then referred me to an orthopedic specialist. Eight weeks after my initial injury I found myself in the office of a kind, older doctor, a specialist in sports injuries. Wanting to hear the history of my injury, he asked me what happened. His smile was evident in reaction to my reply. By the sparkle in his eye and the raised corners of his mouth, I could tell he hadn’t anticipated my reason for visiting him, but was amused by it. As the doctors before had done, the specialist likened my injury to that of a football player, telling me it was okay that I actually sought help. Some injuries can’t be out-stubborned. He told me my road to rehabilitation was going to be a long one, but assured me that he’d helped other football players (Go Ducks!) through these injuries, and it would work out. I’d heal, eventually. Leaving his office in my new, pneumatic walking boot, I had to resist tears. Having been injured for eight weeks and finding myself now needing an MRI and at the minimum three weeks in the cast, followed by even more unknowns…I just wanted to breakdown. I don’t like being slow, or slowed down. I don’t like not being able to keep up. I don’t like to see people rushing by me while I hobble along like the gimpy, graceless, injured person that I am. I like to walk fast, set the pace, have people struggle to keep up with me. I like to move faster, be stronger, go further. And I can’t. Not yet. And I still want to cry because the road to healing seems so daunting, so endless, so unforgiving. It’s full of frustration, full of heartache, full of remorse for what I could’ve done differently…for starters, maybe not try to run backwards? But I mostly struggle with wanting to cry because I desire to sit down and tell my dad that I really hope he’s laughing it up (with me, as I promise I see the humor in this whole fiasco!). I long to point out to him how my childhood stubbornness, my inherited Trucke Pride, my memories of racing him are all partially to blame for this injury. Posted in humor, laughs, life, nonsense, parenting, random, schoolTagged confessions, dad, doctors, family, funny, go ducks, grief, grieving, healing, health, hope, humor, injuries, joy, life, loss, love, nonsense, oregon, Pacific NW, photo, summer, tag, writingBookmark the permalink.